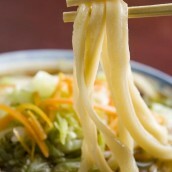 Thick and chewy handmade soumen noodles. Handasoumen made in Handa, Tsurugichou is handmade soumen that is made thick so the texture gets very chewy, and the smooth texture is also exquisite. 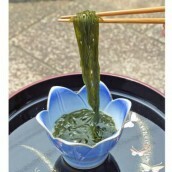 30% of the population of the city has a job related to soman production, and "kadoboshi" is done in a garden where the noodles are stretched to 2.5m long, hanged and dried under the sun. 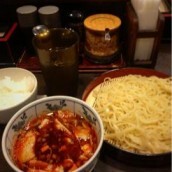 Making somen noodles is such a hard work. 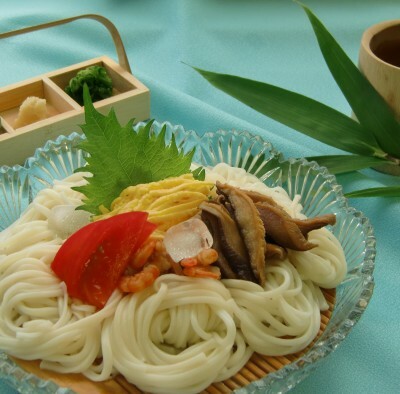 This somen noodle is categorized as hiyamugi for its thickness, but it is labeled as "soumen" due to the long tradition from the middle Edo Period and the request of the local people. Soak dried shrimps and shiitake mushrooms in 700cc water and leave it overnight. Soak dashi kobu in water for 2 hours before cooking. Drain shrimps and shiitake mushrooms, and keep the water. Put the water from the shrimps and shiitake mushrooms, dashi and the water in a pan, and put on the heat. 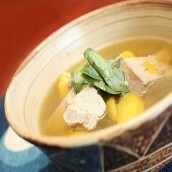 Remove dashi kobu right before boiling, add katsobushi in a dashi bag, simmer for 1 to 2 minutes, and remove from the heat. Take out 400cc of dashi from the pan, and add the koikuchi soy sauce, mirin and shrimps to dashi, heat to boil. Cool it down, and put in the fridge. Soak shiitake mushrooms in lukewarm water to hydrate, and cut into thin slices. Put dashi, shiitake mushrooms, sugar, soy sauce in a pan, and boil down until no liquid is left. Mix eggs and salt, and pan fry it to make a thin egg sheet. Cut it into thin slices. 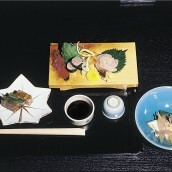 Cut tomato into 8 pieces into wedges, cut aonegi into small pices, and slice sudachi into rounds. 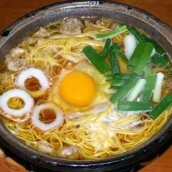 Boil water in a large pan, add handa somen and stir. 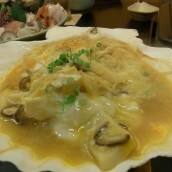 Once it comes to boil again, cook soumen for 3 to 5 minutes over low heat. 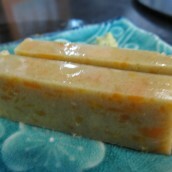 Cook until desired firmness, drain and quickly rub and wash in water, and put it in water with ice blocks. Drain well, dish out with condiments.